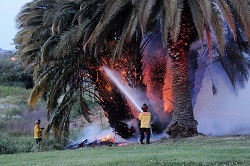 The Vallejo Fire Department's primary mission is to safely protect the lives and property of our citizens. We value customer service as the foundation of our organization. We consider our entire community part of our extended family and strive to ensure we treat them with respect and dignity. The Vallejo Fire Department consists of 86 employees, who are staffed between Administration, Suppression, EMS, Training, and Prevention divisions. The Department averages over 12,000 calls per year and boast two of the busiest engines in the state. Fire Suppression consists of 76 Firefighters, Firefighter-Paramedics, Engineers, Captains, and Battalion Chiefs. The staff are spread across three different shifts and six different stations to ensure coverage to citizens 24 hours a day, 7 days a week. Each shift is led by a Battalion Chief. The Emergency Medical Services Division provides necessary support for our Paramedic Program to ensure our Firefighters are properly equipped and trained to respond to medical emergencies. The division consists of one Fire Captain. The Fire Training Division is responsible for providing continuing education to staff, overseeing the Department's three-year Apprenticeship program, and running the recruit Academy. The Division consists of one Battalion Chief. The Fire Prevention Division is responsible for inspection services, plan checks and permitting, fire reports and investigations, and public education and outreach. The Division consists of a Prevention Manager, two Inspectors, and one Secretary. View our Fire Stations and Administration Building on a map.